This was going to be the year. 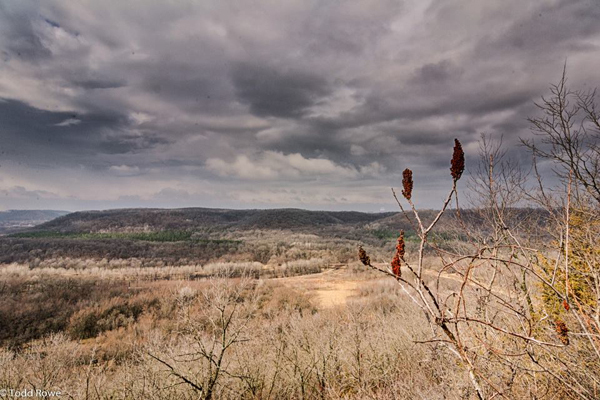 On Tuesday as we marked the first sections of trail it was so dry I popped a cough drop in as I climbed up to the Scenic Overlook, weighed down with 150 markers in my quiver it felt hot – at the top I saw a hazy valley, the landscape as dry as I had seen it in years. Fast forward to Thursday morning – the sky opened up, just a sprinkle at first, then a deluge… yep, there it was, classic Zumbro weather. Thursday night I drove to the top of one of the surrounding hills to grab some cell / internet reception, one last check for the day – the few 100 feet of elevation change saw the torrents of rain morph to whiteout snow propelled almost perfectly horizontal by 25mph winds – yep, this is the Zumbro that has been feared, hated, forsaken, revered and ultimately loved in hindsight by many a Zumbro runner. As I sat in my warm truck I came across a post my buddy had made regarding the origin of the name ZUMBRO – translated means “River of Embarrassments”, how appropriate – had Zumbro lured us in once again with the promise of the perfect year, gained our trust and now this! This year however luck proved to be on our side, race morning started just dry enough to have a comfortable start for the 100 milers – a few hours later some rain, this time nothing to write home about… then… the SUN – and it stayed for the next two days, for the start of the 50 a clear sky with brilliant stars and for the 17 a perfect “bluebird” Spring day. Between having the largest ever race fields for each distance, the best talent seen to date and beautiful whether, none of the races disapointed – in total four new course records were set and a myriad goals were reached by front-runners, mid-packers and back-of-the-packers alike. Alas, this report is a teaser and meant to be a very brief recap – a complete race report will appear in Ultrarunning Magazine but as is tradition we offer a few quick thoughts on the race and some interesting stats. Past race reports can be found HERE – do you have a blog race recap, published photo gallery or testimonial you would like to share with us, please EMAIL US and we will get it up on the website! I would like to personally extend a thank you to all of the courteous, conscientious and downright amazing runners we had at Zumbro this year – what a great group of people and a great group of runners. Well, its obvious isn’t it, without runners there is no race but what is the heart and soul of a trail race, an ultra? Its the volunteers & the leadership they bring, the example they set – I counted no less than 20 volunteers who spent at least 8 hours volunteering and also ran one of the race distances, I counted no less than 15 volunteers who were past Zumbro 100 mile finishers and no less than three volunteers who were past Zumbro 100, 50 or 17 mile winners – people marvel (we have the emails and testimonials to prove it) at the event, the experience that is Zumbro – well, it is not by mistake that Zumbro functions as it does – Zumbro and some of our other Midwest ultras run as well as they do because of the efforts of those dedicated volunteers that come back year after year. Thank you to all 150 volunteers that gave in combination over 3500 hours of your time over race weekend – simply incredible. A special thank you to Kurt Decker and TC Running Company for their tireless work down at Aid Station 1/4 again and for Dan Harke (past Zumbro 100 mile finisher) and crew picking up at Aid Station 2/3 overnight shift from Chris Koch for the foreseeable future – a huge thanks for Dave Koch (Chris’ dad) for supporting Dan and coming back as well! To all of our volunteers and sponsors, thank you, thank you, thank you! A thank you letter to our volunteers can be found HERE – it’s worth taking the time to read. This was the first Zumbro since good friend of the race, past volunteer, Zumbro 100 mile finisher, Gnarly Bandit finisher, husband, father and friend Aaron Buffington passed away after a hard-fought battle with cancer. 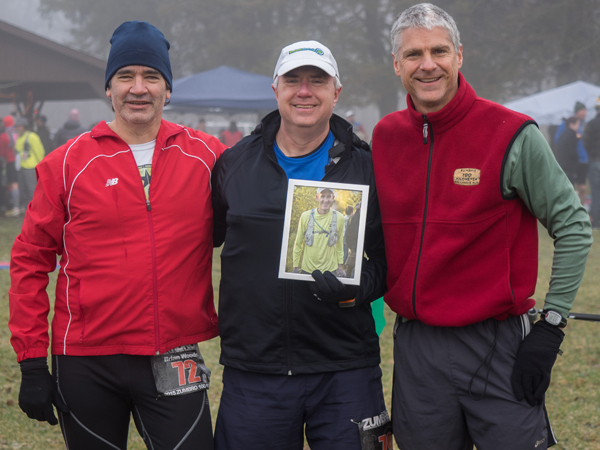 Several Zumbro veterans ran in his memory this year and placed his picture at the finish line and at the start of each loop Aaron greeted friends with that huge smile and offered a lot of inspiration – Aaron, you are deeply missed by many. Zumbro is typically the 1st or 2nd weekend in April – The 2017 date will MOST LIKELY be April 7-8. The Zumbro races are always held the weekend before Minnesota Turkey Hunting starts – sometimes these schedules are not released until late fall of the upcoming year. Shelly Groenke, 25th Overall and was the 1st Femal Grand Master (57) – impressive to say the least.